Arnott and Vederoff Ancestors - Headstone of Fanny Ashiffina. Lake View Cemetery, #3, 44A. 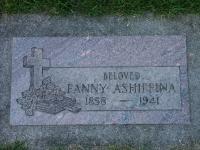 Headstone of Fanny Ashiffina. Lake View Cemetery, #3, 44A.